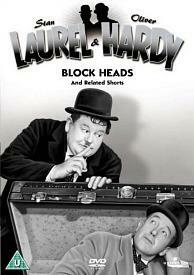 Do you remember watching the old Laurel and Hardy comedy films during the school holidays? The duo are widely regarded as the finest comedy pairing of all time, and it is no surprise that Stan Laurel learned his craft in British musical hall, whilst Oliver Hardy grew up with American vaudeville, which is known as "the heart of American show business". 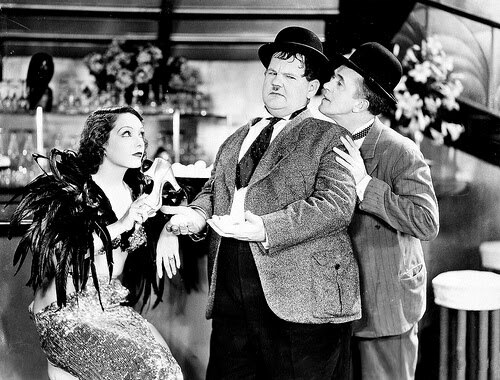 Whilst Stan and Ollie both enjoyed considerable success as solo performers, it was the on screen chemistry they achieved that ensures their lasting reputation. Indeed, unlike many of their contemporaries, the comedy of Laurel & Hardy is timeless, with many of their films being as fresh today as they were when first made. 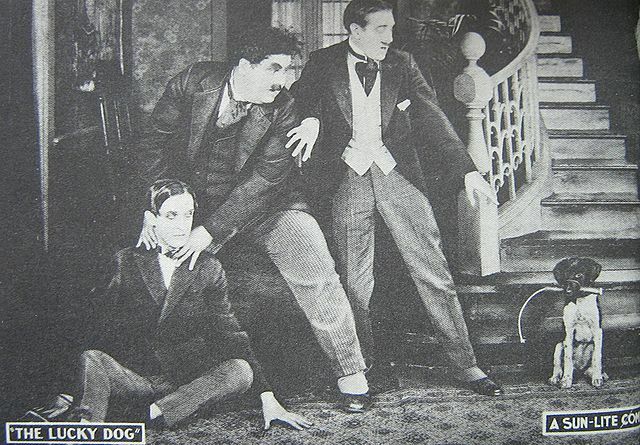 The two comedians first worked together on the short silent film The Lucky Dog. After a period appearing separately in several short films for the Hal Roach studio during the 1920s, they began appearing in movie shorts together in 1926. The boys officially became a team the following year, and soon became Hal Roach's most famous and lucrative stars. Among their most popular and successful films were the features Sons Of The Desert (1933), Way Out West (1937), Block-Heads (1938) and the shorts Big Business (1929), Liberty (1929), and their Academy Award-winning short, The Music Box (1932). Personally, I found the short features funnier than the full-length ones, as the storyline didn't override the comedy. Busy Bodies and Towed In A Hole are personal favourites and packed with laugh-out-loud slapstick fun. 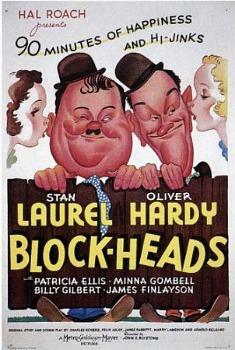 I found the aptly-titled Block-Heads to be the funniest full-length movie as it features the perfect combinations of hilarious slapstick and very clever gags. Classic moment's are when Stan manages to wreck Ollie's car with a truck load of sand, and when he drives the same car through automatic garage doors. Well, this had me in stitches - there is just so much top-notch comedy crammed into one film, and yet there is still enough room for a strong storyline. 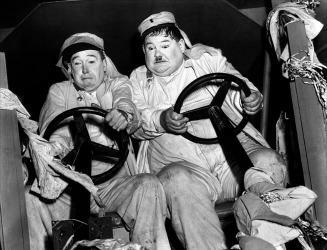 As I mentioned, the Laurel and Hardy partnership officially started in 1927, but I became a fan in the 1970's after watching their films on BBC2 (UK) during the school holidays. Of course, as a child I never really analysed exactly what it was about this pair that made me laugh. I just knew that every time I saw them I was in hysterics. As an adult, I can see all of the little things that made them just so special. For instance, when Ollie needed to sweet-talk his wife into his good books, he would nervously fumble with his tie. Then there's the way he would look directly into the camera when Stan had done something ridiculous - which was quite often! Making eye contact with the camera was unheard of in the 1920's, but what genius! Then there was Ollie's catchphrase - which was first heard in the 1929 short Unaccustomed As We Are - "Why don't you do something to help me?". And, of course, "Here's another nice mess you've gotten me in to!". By the way, many wrongly quote the catchphrase as "another fine mess", and this confusion is because this was the title of their 1930 short film. Oh yes, and Oliver Hardy had a superb singing voice, too! Stan Laurel was very expressive with his face. He would go from whimpering to a grin to a puzzled look in an instant. Stan had the knack of getting both of them into trouble. He would give Ollie that daft but warm smile to try and keep the peace. But whenever he tried to put things right, he would always end-up making matters worse. Who can forget those clever little tricks he would perform (remember when he made a flame appear from his thumb in Way Out West?) that had jealous Ollie trying for himself - it always ended in tears for ollie! Overall, it was that strong bond between them that put the icing on the cake - they just worked brilliantly together. Those slapstick routines never felt as though they had been pre-planned and just happened so naturally. died on 23 February 1965.
died on 7 August 1957. 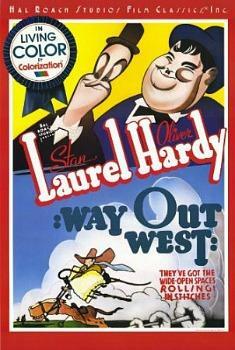 The first appearance on film by Laurel and Hardy. Lucky Dog was produced in 1919 and released in 1921. He's best-remembered for saying "Doh!" quite a lot and having raised eyebrows and an angry squint in one eye. His "did I just see that happen" double-take reaction with his head was also hilarious - no words were required! 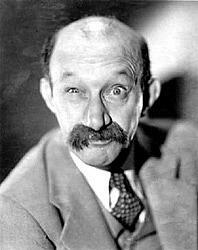 The Scottish actor James Finlayson (27th Aug 1887 - 9th Oct 1953) featured in 33 of the Laurel & Hardy films. He would often play a villain or a person intent on getting revenge. He also starred alongside Stan Laurel in 19 films, and opposite Oliver Hardy in five films before Laurel and Hardy were teamed together.